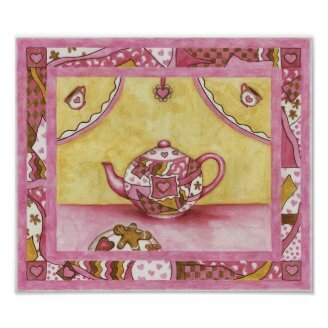 Illustrated teapot art shows appreciation for the beverage of tea and is a great home decor item. There is something special about drinking tea from a lovely teapot, isn't there? 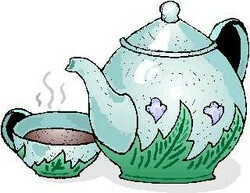 Teapots come in a variety of shapes and sizes and have inspired artists to illustrate their form for many years. Who knows why an artist chooses to use this functional and practical kitchen item in their art? Perhaps it is the artful design of the teapots themselves or perhaps it is the comfort they receive from having enjoyed drinking the beverage of tea. 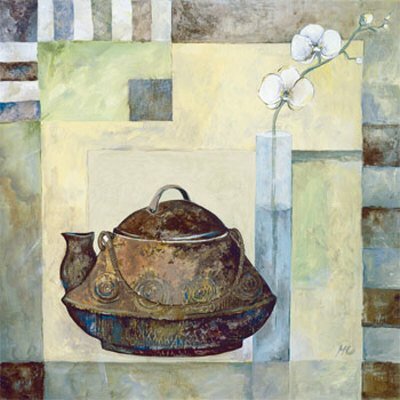 No matter what the reason there are many wonderful examples of teapot art that can be used in our home decor. Perfect for a kitchen or any room that you want to celebrate the teapot. I have found some fun examples of teapot art. Some are whimsical while others have an elegance about them but all honor the teapot. The wonderful thing about adding some illustrated teapot art to your home or office decor is that it can fit just about any style that you need. You can find posters and prints that are art deco, Granny Chic, traditional, Asian, or contemporary in style. It is relatively easy to find the color combinations that will work with your interior, too. Just like the teapots that have inpired the art, the illustrations come in all shapes, styles, and colors. The actual teapots that we use to serve our favorite blend of tea can be made from many mediums. There are fancy teapots of sterling silver or silverplate and usually come in a set to serve on a tray. Some tea pots are made of red clay or terra cotta and are believed by many to make the tea taste even better. A popular type of clay pot is referred to as the Brown Betty. It has a simple and almost classic style but from what I can gather it isn't the color of the teapot or the shape but the fact that a special type of red clay is used to make the pot. There are lovely porcelain teapots and ceramic teapots and even copper pots. It is no wonder that artists for centuries have honored the little teapot by illustrating it in pictures for us to enjoy. Did you enjoy my examples of illustrated teapot art? Thank you for stopping in! I love beautiful teapots, and I love to collect them. I love those illustrations. Tea for me as well - I love tea and coffee and I seem to collect teapots too. They certainly look pretty on a wooden dresser or sideboard. Great page. I have a teapot collection in my kitchen. I'm just a tea kind of girl. Well, these are just beautiful. 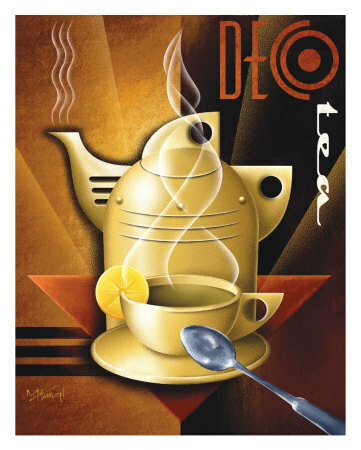 And certainly these teapot art illustrations are not just for the kitchen. I really enjoyed learning about them. thank you. Yes I did enjoy your teapot artwork. They would look perfect in my kitchen. If it was finished. As soon as we get the walls finished I have to find posters and pictures like this. For now I'll just have to sing, "I'm a little teapot" as I cook.